The year 2018 showed that the stock market is, again, teetering on the verge of another downturn. In this financial climate, many investors seek alternative assets to diversify their portfolio. Bitcoin, itself forged amid the last financial crisis of 2008-09, has proven itself to be a popular alternative to diversify beyond betting solely on the stock market. This article will explore why a Bitcoin Roth IRA may be possibly the most attractive Digital IRA option for Bitcoin (BTC). It will also address the benefits of Bitcoin as well as upcoming trends for the cryptocurrency. Why is a Roth IRA particularly suited for Bitcoin investments? If you expect, like many crypto bulls, that the digital currency market will grow significantly in the coming decades, putting Bitcoin in your Roth IRA means that all of your gains in that account will grow 100% tax-free (for qualified distributions). Another advantage of a Roth IRA is that there are no required minimum distributions after 70 ½ years of age. In contrast, a Traditional IRA mandates such distributions. There are some considerations to take into account with Roth IRAs. For one, contributions aren’t deductible like with Traditional IRAs. Also, Roth IRAs have income eligibility requirements, unlike Traditional IRAs. Finally, when it does make sense to purchase virtual currency within a Traditional IRA, you can read more about such Bitcoin IRAs here. 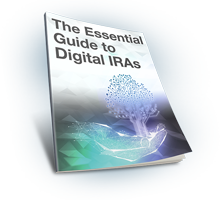 A Digital IRA is a type of Self-Directed IRA (SDIRA). The most common investments in retirement accounts tend to be either very conservative in nature (e.g. a bond, money market account, mutual funds, or even an exchange-traded fund) or are dependent on an ever-volatile market (e.g. stocks). Many investors choose to diversify with alternative assets, and a self-directed retirement account option was created over four decades ago for specifically this purpose. A self-directed IRA account allows investors to choose specifically the types of assets classes to hold in their IRA. This affords greater freedom but also imposes more of the burden of compliance on the investor. With an SDIRA, you still invest through a custodian, but the investor has the legal obligation to ensure that only compliant investments are held in the account. Allowable IRA investments in such an account include precious metals, some types of real estate, certain natural resources, and other asset classes. An example of a prohibited transaction includes real estate purchased for personal use. A qualified custodian can advise you about these investment options for retirement savings. To learn more about self-directed retirement plans, visit our Self-Directed IRA and Bitcoin page. Digital currencies are allowed in SDIRAs, and such accounts have been termed Digital IRAs. SDIRAs, including Self-Directed Roth IRAs, are particularly suited for Bitcoin, in fact, since gains from investments with greater growth potential (though with more risk) will have tax-free distributions. Bitcoin was the first and most popular cryptocurrency. It was launched in early 2009 in the darkest months of the 2008-09 financial crisis. Against this backdrop, as fiat economies were weathering blows, Bitcoin began to flourish. Bitcoin is a decentralized ledger (blockchain) of all BTC transactions that bypasses the need for traditional banks and centralized overseers of finance. This is achieved through the use of cryptography rather than through human intermediators (such as financial institutions or central banks). Since Bitcoin is decentralized, crypto investors generally shoulder the responsibility for knowing how to secure their own digital wealth. Though Bitcoin operates apart from financial institutions, many governments have recently been trying to regulate it. In recent years, though, regulators in the U.S. have been generally (if cautiously) encouraging the blockchain industry to develop and grow. As of early 2019, there is no clear and consistent definition of cryptocurrency as an asset class across agencies of the U.S. federal government. Future regulations may make cryptocurrencies more or less appealing to investors. Even now, the IRS requires documentation for every single Bitcoin transaction, no matter how minor, because it classifies digital currency as property. This often creates a headache for many crypto investors. If Bitcoin is held within an IRA, though, this is much less of a concern. All distributions from IRAs in retirement–no matter what the investment class is–are treated as income by the IRS (and not, for instance, as property sales or capital gains). To learn more about Bitcoin and other cryptocurrencies, visit BitIRA U. Historically, the value of the stock market has proven to grow over the long term. But history has also proven that stocks are prone to short-term busts every decade or so. Investors that don’t diversify their portfolio ahead of time often panic and sell their stocks–even within their IRA–when such busts occur. For this reason, many investors choose to diversify with alternative assets ahead of such market busts. Especially when people begin to lose faith in current financial institutions, assets like Bitcoin become an appealing alternative. Unlike more traditional investments, Bitcoin does not rely on trusting banks to do well by their customers. Exchanging one asset type for another is possible even in an IRA financial account. Such transactions within an IRA do not incur a penalty by the IRS, nor are they taxed (like, for instance, a long-term capital gain would). In other words, IRA funds can be moved from stocks into Bitcoin and back into stocks, as often as one likes in response to market conditions, without paying any taxes or fines. Since the invention of the printing press, new technologies have offered individuals greater freedom in life and access to information. It may take some years, but innovations such as the automobile, telephone, internet, and others tend to achieve widespread adoption if they are fundamentally helpful for society. Bitcoin was the first cryptocurrency that freed citizens from reliance on millenia-old financial institutions (and physical money) to conduct transactions. The digital coin has also spawned a new blockchain industry that’s continued to thrive even amid the 2018 dip in crypto prices. Despite many crypto bulls’ optimistic forecasts for Bitcoin, the future is always uncertain. Because cryptocurrency is still an emerging industry, Bitcoin and other coins remain risky investments. This has been the case with all transformative technologies in the past, as well. It’s a good rule of thumb to proceed with caution with all high-risk, high-reward situations. A Roth IRA account is particularly well-suited for Bitcoin if you do believe that the primary cryptocurrency has a bright future in the years ahead. A Bitcoin Roth IRA allows an investor to make the most of any gains that BTC may accrue (by not having to pay an income tax upon distribution). After the popularity of Bitcoin grew, other cryptocurrencies were created (called “altcoins”). There are many such digital coins now, and some can even also be held in an IRA. There is a segment of the cryptocurrency community that argues that the evolving Bitcoin protocol is robust enough to eventually outperform all other cryptocurrencies. Such proponents are called “Bitcoin maximalists”. This is not an entirely extreme proposition. Bitcoin continues to dominate the market of digital currencies. In 2018, many new altcoins ended up flopping, while Bitcoin market cap grew. That year was tough on Bitcoin, too. But those that have followed Bitcoin since its inception know that such dips have happened to it before on the road to mass adoption. So far, Bitcoin has historically always recovered to continue growing at a rapid rate. Some even see Bitcoin as an important step forward for protecting individual freedoms in a technologically-advanced world. Oct 2018. The 10 year anniversary of the publication of the Bitcoin white paper has shown just how far the concept of a decentralized currency has come in such a short span of time. Feb 2019. The Lightning Network is considered to be Bitcoin’s answer to scalability challenges. The project received a significant publicity boost as various high-profile tech innovators passed its “Lightning Torch”, including Twitter co-founder, Jack Dorsey. Apr 2019. Bitcoin logged its 400 millionth transaction since the first BTC transfer in 2009, hailed as a significant step in widespread adoption of the cryptocurrency. For those wanting to invest in Bitcoin as the new industry continues to make its mark on the world, holding the asset in a Bitcoin Roth IRA should be an option to consider. Such an account allows an investor to reap the benefits, tax-free, of any of Bitcoin’s potential growth in value. So, what is the process of opening a Bitcoin Roth IRA? As mentioned above, even a Self-Directed IRA such as this requires by law that the investor works with a qualified custodian. There are benefits of this process, though, particular to cryptocurrencies. Some financial services companies store your cryptocurrency for you, taking numerous security precautions to ensure that your digital coins are safe. A few select companies even offer complete insurance coverage for a crypto IRA. Such protections offer investors more peace of mind than trying to keep personal crypto money safe just on one’s own. To open a Bitcoin Roth IRA, you have to do an IRA rollover from an existing qualifying retirement account. Financial services companies can help IRA investors with completing this paperwork and reviewing purchasing options for Digital IRAs. It all starts with a phone call. To find out more about Bitcoin Roth IRAs and determine if you qualify, call (800) 299-1567.